When IDW announced there was going to be another Samurai Jack comic, every fan of the original animated show was ecstatic. The news was made even sweeter knowing that the capable Jim Zub would be handling writing duties while Andy Suriano, an artist on the original show, would be drawing Jack’s new adventures. Now, with the first arc over, Jack’s first new adventure in years comes to a close. The “Threads of Time” storyline wraps up as Jack closes in on the final Thread of Time, the one in the possession of his nemisis Aku. Journeying to Aku’s personal chambers, Jack is determined to get the final Thread and return to his own time using their time-traveling abilities. The final battle with Aku goes worse than planned, leaving Jack to think of other ways back. Zub is a great fit for Samurai Jack, well-versed in the action aspects of the story as well as the lighter, more humorous parts. The arc as a whole has been well-paced and been a great addition to the Samurai Jack mythos. 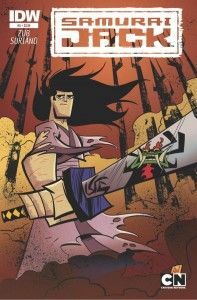 Suriano’s art is, naturally, a great look for the book as it’s the look for Samurai Jack, the look of the original show. The two-page spread detailing Jack’s journey to attain the threads was a fantastic piece, using the threads to naturally create panels and allowing Zub and Suriano to portray Jack in some harrowing and ridiculous situations. The complaint with this issue is the way Jack is made to continue on his journey. It seems too convenient and a bit out of character, honestly. Jack seems to be too great of a warrior to be taken by surprise like that, but it does set up more adventures for him, so I’ll take it. Jack is back for even more comic adventures. This is good news. With the first arc wrapped up, Zub and Suriano are jumping into smaller adventures in the next few issues. Fans of the show should already know how good this comic is and, if not, they’re missing out. Parental Concern: Mild. Just a bit of violence.